Again, it’s not about disease, it’s about control over land, wildlife and people. 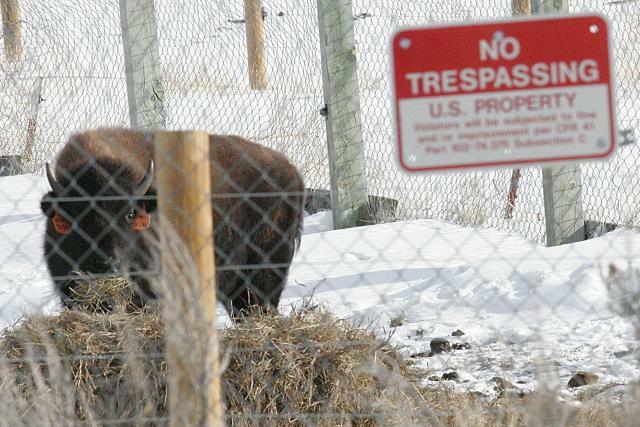 Bison in quarantine near Gardiner. While I think that the quarantine plan is misguided I do believe that those bison in the program should be allowed to roam freely as wildlife. This bill would make it illegal to transport the bison over Montana’s highways which is done currently when bison are hauled to slaughter. Apparently the transfer of bison to the Eastern Shoshone Wind River Reservation in Wyoming would be permitted. Another issue that is raised here is the fact that the bison currently at Fort Peck Reservation have been hybridized with another species, cattle. I don’t know what the plan is for managing any bison received from this program would be but I hope that they would be separated from any that are hybridized so that there is no further hybridization. Genetically pure bison are rare and they should be valued for their special nature. The quarantine facility has other problems not raised in the article too. How does removing calves from the rest of their herd and raising them on alfalfa affect their behavior and social structure? Can that social structure be regained over time? Habituation to humans can cause severe problems in other species such as wolves, bears, and coyotes as well as other species. What will happen to those bison that don’t get relocated? Will they be slaughtered too? These people seem to be pulling out every reason they can to be irrational about this issue. Behavior, social structure, habituation,..? I have been thinking about those issues for a long time, and have thought that it may not go well for them. My line of thinking relates to what is known about elephants. Although bison are physically different their herd structures, behaviors, social interactions mirror that of the elephants. Both are very complex animals. In Africa there has been serious problems with orphaned elephants that have been released. They are extremely aggressive, obviously irritated, and angry. Rogue adolescents form groups/gangs and become very destructive and dangerous. Anything in their path including people, villages, etc., is destroyed. If I remember correctly, there is no alternative to killing them. And I think they were all males. The elephants and the quarantined bison have not learned how to be the creatures they are. Even with people the early formative years are crucial to becoming part of society. I am reminded of a particular study with baby monkeys in which one was kept isolated while the other was with it’s mother including a small group of monkeys. The isolated monkey seemed to be in a constant state of fear. There is a very well known case of a girl that was kept in a closet, with no human interaction. A documentary was made about her and the psychiatrists and doctors, and the records they kept about her and the progress she made. These are just a few quick examples as these cases are obviously too complex to get into detail. However, in comparison and contrast exists many similarities. What irritates me most about humans is our propensity to tamper with nature and usually with dire consequences. Yes. Bob Jackson has written here at length about the matter of herd structure. There are a number of major problems with this bill. First, the state of Montana can pass any bill they want but it will not change the fact that the state has absolutely NO jurisdiction at the federal or tribal level. Second, the National Bison Range has evidence of hybridization with cattle and Johne’s disease, so this would not be a good place to send the quarantined Yellowstone bison. Third, the Wind River Rez is way too close to a number of elk feedgrounds and these translocated bison could become infected with brucellosis by these elk after suffering through years of quarantine. Therefore, they will have to remain fenced the rest of their lives and may never be allowed to be a free-ranging herd. The success of a quarantine plan was dubious at the outset and now state of Montana is determined to make it failure for everyone involved, and the bison will suffer in the long run. As for elephants and bison…I have heard that they do share similar social behaviors. The problem of rogue juvenile elephants was solved in a few reserves when older animals were brought in to teach them. How close is the nearest feedground to the Wind River Reservation? I think the closest one is on the west side of the Wind River Mountains at least 100 miles or more away. I hope to see free ranging bison on rez soon. Just as humans and bears are carnivores without the training to eat vegetation, so to are herd grazers limited to being “grassivores” without the training to eat broadleaves. Thus, those quarantined bison calves, and their offspring, for generations to come will be very limited in sustainable ecological compatability. It makes no difference if they are “Aryan pure” or not if they can not function….and these animals can not and will not be able to function!!! They are just a shell of a bison….or exactly the same as 95% of all ranched bison ….where they are weaned and fated to monotonous and unhealthy diets for the rest of their lives. All herd animals share similar social structures. It is the same structure as all indegenous humans and wolves. In fact it is the same all across the face of this earth. Every species has its own quirks but all in all it is the same. And as for adult elephant males making things right with the addition to rampaging renegades think of a bunch of delinquent teenage humans and then non related adult males added to the mix. Law enforcement for any species stops the aberrant behavior but there still is much lacking in training and hero images needed for these youth. The elephant adult males added would fill the same embyrionic function of social structure change the SS had in Nazi germany ….or any feared dictator goon sqads. It takes a lot more to gain the social infrastructure needed to make functional systems. Adding the bull elephants was just the start. They were the firemen aiming the hoses onto the unruly demonstrators. What makes an ecosystem “functional”, or for that matter “dysfunctional”. I have heard those terms thrown around a lot here, and I’m not sure everyone is using them to mean the same thing. May I ask you, how would the social structure be effected if the Yellowstone Bison were allowed to leave YNP freely? Would they all return without hazing, or would they continue on northward following the winds? Also., how would the bison’s social structure be effected if there were cows in an area where single bulls migrated? For instance, what if there were a way to predict the migratory behavior (already is I believe) and females and some calves were released into an area that you could predict the bulls would roam to? Would a faux adaptation occur? ( I think it would be unlikely, but somehow, historically that had to have occured and a new herd/structure would have been formed.) Just curious. let us not forget that this plan still calls bison livestock, unless I am mistaken. Until we treat bison as wild animals, we will continue to fail in our endeavors to act in their best interests. Just a correction here on the original story; it’s not the Eastern Shoshone who want the quarantined bison at Wind River but rather the Northern Arapaho, who share the reservation. To go in reverse for response. Jim, I think deep down the Indians want bison because they themselves want to be pure, free and live as the days of old. They may talk of wanting genetically pure bison but if they took this literally just about all of them would have to eliminate themselves because of their “impure” White infused genetic stock. The Indians I talk with want the Yellowstone herds for two reasons; one, to get a bunch of govt. money and two, the empathy to take in abused orpans no different than folks want to help refuges from war strive countries. They do not care if it is a buffalo with genetic purity or not. This perceived need is limited to the scientists who they themselves think of as superior to others. This need is also common with other lay humans who also think of themselves as superior to “lesser” folk. If the herds in Yellowstone were functional (which with the reductions and harrassments they are not) then increase of range would be incremental in scope…as long as range is consistent in suitability. Thus, the grazing lands around West Yellowstone, the Gallatin and the Yellowstone Valley would see Yellowstone bison herds fan out to include both year round resident as well as migratory herds outside the Park. If winters included heavy snow years then West Yellowstone resident herds would mostly become migratory to places further away. Only the places where cow-calf elk now winter in West would be where bison cow calf herds would live year round. Same for the bulls. Elk and bison bulls would winter where elk bulls now can. The Gallatin would have more non migratory cow-calf herds. And even more in the Yellowstone Valley. Eventually bulls from new resident herds would be placed in position by the herd to guard the lands for winter use for the cow – calf herds going up to the headwaters of areas such as Tom Miner for the summer. This is how the Pelican – Mirror herd keeps their winter range on the lower Pelican from being grazed out by Hayden animals in the summer. If hunts were allowed on these guard bulls in West, the Gallatin and Yellowstone Valley , however, then the newly established resident herds would lose out to Yellowstone proper bison herds. The swarms from the Park would overwhelm. And genetic variety would suffer. Then the herds being pushed out would desperately seek out new lands further away. Scout bulls would be sent out over passes and difficult terrain to the surrounding valleys of Ennis, Bozeman and livingston. If these bulls were allowed to spend several winters there then the displaced cow-calf herds would follow first with small cow-calf bunches and finally enmasse. They then would colonize these valleys for permanent home use. Think of the Oregon Trail and how lands were discovered, then overwintered by men….and then wives and children were carted West with a few males escorting and you get the idea how big leaps of populations are made. Also think of the lands of Eastern United States and how they were incrementally expanded. Both were orderly expansions and wildlife managers could assure the same limits around Yellowstone if only they understood population movements and the roles played by the different sexes and segments of a population. So Vickif, bulls go first then females follow. When we transport starter herds to purchasers lands we trailer bulls the day before. Then we ship the cows and dependents with just a few active aged bulls. Upon letting them out of the trailers the female component runs around the bulls instead of running the perimeter pasture fences trying to get out (this is the reason bison producers think they need to limit starter herds to only yearlings and calves. They don’t understand the males roles). There are two different scenarios with “dysfunctional’ and “functional”. One is when defining herds based on multiples of individuals as compared to social structure extended families. The second is in comparing two different social structure families…one being healthy socially and emotionally and the other being “dysfunctional” because of such things as abuse and inept management by humans. In the human world it takes a family 3-4 generations to become healthy and functional after abuse is recognized. The same applies to all herd animal species. If unfettered competition between bison families happened the functional families would win out over those families dysfunctional. This is also why wolf packs die out or its members are absorbed by other packs. Anyway this is what I see as defining functional and functional. As for others, I see bison producers now advertising herds of social or family order bison and they don’t have the foggest of what this means in their herd. I guess at least there is a start of recognition of classification differences. Just to make clear, all I was doing here was correcting information about what tribes are doing at Wind River, not making a comment on why tribes are doing what they are doing. The Eastern Shoshone, according to Baldes, did not want all the red tape that go with quarantined bison, especially the requirement of further testing and keeping the herd fenced for years. Their plans are for a free ranging population, that however, must be kept separate from the herd of quarantined bison that the Northern Arapaho want. That’s why they’ve been pursuing the buffalo from the Henry’s Mountains. You are doing so much damage here when you attempt to speak for the Native people who want to be involved with the conservation of the Yellowstone bison. Native people are educated enough to understand the difference between hybridization between species and racial mixing within a species (human beings). There is no funding associated with accepting the quarantined Yellowstone bison. In fact, any tribe that does accept these animals has to find their own funding for fencing, feed, veterinary fees, etc. Tribes want only to be free to exercise their rights as sovereign nations, restoring our native species, as intact organisms is a crucial component of that effort. I don’t know what “Indians” you have been talking to, but they don’t speak for all Native people who care about the Yellowstone bison. And you should refrain from attemping to do so yourself. May I call you that? You see a buffalo walker was a lot more effective at moving buffalo than those that ran them. If you care that much about buffalo then I would have to think you want to be honored not degraded with an appropriate name. Then again maybe it is the “rush” of identifying with the Wild buffffffallooo as they go pal mall across the Plains….free as the wind blows…. that you wish to be. Tell me, which one do you identify with? Both? As for me, I identify with none of these monikers. Yes, the folks in the park called me Aj. To me I thought it was ok just because it had a nice ring to it. Maybe that is so with you with “buffalo runner”? I guess what I am trying to say is I don’t think anyone has a lock on what we enterpret of others. Yes, I know pride in the group we want to identify with means we honor that association. But does this mean others outside this group have to whisper in reverance to those wanting solidarity within themselves? It gets kind of wacko with all this elitisism. The best example I can think of is radical Muslims with their Koran don’t touch thing. As for myself, I don’t form associations distinct as a Whitey and I don’t try to be an Indian either. To me we are all the same and this gives us the right to discuss others without having to bow to them. I saw too much of this in Yellowstone. Not only did the person with the higher grade think they were more important in their job, but most also thought this meant they were a superior person. The govt. manuals are littered with the word “subordinate”. On to your ‘discussion”. I talk with the same people I see you talk with. Does that make them non representative Indians when I see them, but then when you speak with this person 10 minutes later they then speak for all Native Americans? Come on, you may need pride to overcome all that adversity in “your peoples” past but I suggest the fight and fire can be directed in more meaningful ways. There are too many cases in history where the oppressed coming out of the mud then dish out the same degrading stuff that happened to them. All this “people” stuff has been used throughout historyto segegrate and then eliminate all others. I would expect you to be able to assess items of interest of Whites, or Blacks, Yellow or Purple people without any of them becoming offended by you doing so. Why is it offensive if I discuss the “greater you” (Big Lewboski here dude)? Or for that matter if buffalo are your “brothers” does this then mean I have no right to enter into your hallowed ground relationship with them. Do you feel just a bit offended when I talk of bisons social family order? None of the 50 bison tribes I presented to had the foggest the buffalo they were “raising” had the same extended family needs as they themselves did. Brothers identity was some illusionary thing that made folks feel good. Do you think this kind of intimate family talk should be limited to “your people”? Well, family social order is in all human and herd animal evolution. Brotherhood with animals is not limited to your tribe, your people or any peoples. As for hybridization between species and the supposed lesser evil race mixing, there is no difference. It is an attitude issue. And what is a specie anyway? It is a Whiteman term. It is a classification of segregation perpetuated by those in academia who themselves feel superior to others. My assessment is the further we as a species gets away from extended family bonding the more we as individuals have to elevate individual traits. Brains may be highlighted in isolation but they are only one equal part of extended family needs. Do you think your ancestors on the Plains would have honored a buffalo, with one cattle marker out of a thousand any less than than one with a bit of ancestoral mammoth or camel in their blood? This line of racial purity study may be your marker, but I ask to try and put it in perspective with what your grandmother and her mother and then her grandmother thought was important. I think it is honorable for any population or “tribe” to want to bring back the buffalo on the terms they need to give identity to themselves. I do not believe in limiting this “recovery” to a chosen few…and at the same time isolating yourselves from others to attain this identity is the way to go. What this purity of species “thing” has done is rip bison families apart no different than your familes were ripped apart with forced boarding schools. If you really had empathy for your “nation” then you know it takes committed families to make up this nation. I guess if that is your goal then trying to figure out how to bring in bison families, not remnants of purity, would be the number one focus. Your line of cohesiveness has a lot of problems. If the “chosen pure” happened to be a part of supposed impure familes what do you do then? The Nazis had all kinds of formulas to identify the chosen ones. I liked the one where the offspring of mixed blood family was German unless the Aryan parent died. Then the kid became Jewish and both the parent and the kid went to the gas chambers. As for funding these academic Whiteman pure buffalo, it does come out of our govt. coffers. No tribe I know of wants bison as an inhouse budgeted project. Govt granys come in. Segments within these tribes, yes, but the tribes themcelves get a lot more money from cattle and crop leases to white people. I ask you to go up the South canyons of Ft. Belknap. Look at all the signs honoring Indian cattle ranchers. This is the reflection of tribal leaders. Yes, a bison herd and now maybe an Aryan pure herd but the funding for fences, caretakers and administration comes from the govt., not their tribe whiteman rent. And the White govt. wants the impure Belknap herd to “go away”. To even suggest this (Ft. Belknap herd caretakers wouldn’t do it) means the govt. is using leverage of cash. Enough for now.